2. On multi day trips especially in colder caves staying as dry as possible is critical. The water is not your friend, so staying out of waterfalls with rebelays can make the trip safer and easier. The Emergencies and Rescue section starts with how to improvise various pieces of gear then covers topics including small party self rescue, “don’t panic and don’t endanger yourself”, then dry and wet horizontal rescue. There is an extensive section on pick-off methods. Again, they use just the Frog system and the rescuer and patient are lowered together. In On Rope and the NCRC method, the patient is lowered separately. Pick-off techniques where the rope is cut are even included – this seems to be taught more in the Canyoning area where one must get a patient on rope out of the water quickly. Even options for dealing with flooding situations are included. The book begins to wrap up with some pages on surveying and documenting the rigging, like climbers document the pitches of a climb, and finally concludes with a conservation note. Marbach’s original treatise on single rope techniques, Techniques de la Speleologie Alpine, was last revised in 1981 prior to the publication of the much-updated third edition in 2000. Only now has this seminal work on caving “the French way” become available in English. As European rebelay-style rigging and the “Frog” system of climbing rope gain popularity in North America, this work replaces Alan Warild’s Vertical (published in second edition in 1990, recently upgraded on a CD edition) as the definitive work on European-style vertical caving. Many of Europe’s premier caving areas are located in mountainous “alpine” environments and may explain the title, but I find the techniques applicable to caving in general and not just the cold, wet, vertical caves found in our Rocky Mountains and the high plateaus of Montana (where I have been doing most of my caving of late). Melanie Alspaugh has done a superb job in translating the technical French of the original edition. My collegiate French allowed me to understand the captions, tables and most of the simpler concepts presented in the 1981 edition but the slang and technical terminology were problematic. That is not the case with this English translation; it presents complicated procedures (such as pick-offs) clearly. Melanie’s translator’s note in the foreword explains her aim to make this book “…as relevant and complete as possible for all English readers…” although she favors American terms (specifically, Texan, by her admission!). The book is divided into four sections: Equipment, Physical and Mental Aspects, Underground and Conclusion. Equipment aids the novice caver in selecting proper clothing, cave packs, lighting and elements of the single rope technique system, as well as items necessary to rig the cave such as ropes and anchor hardware. The section dealing with physical and mental aspects covers only eight pages, something I would like to see expanded in future editions. Caving movement, both so-called horizontal techniques as well as technical rigging and dealing with common emergencies constitute the majority of the book. Early in the book the safety standard of the European Community is explained, denoted by the “CE” mark (Conformite aux Exigences) if a product meets standards of regulation within its category. Such a mark is a guarantee of at least a minimum of safety. Although no such “community” standard exists in North America, it is comforting to know such tightly controlled testing of European-manufactured gear does occur. As to content, I found the book very informative about items of equipment that normally are not covered well in recent caving books dealing with technique, especially vertical caving. This is especially true regarding caving oversuits and undersuits, which are gaining in popularity among American cavers. The authors include key points, tips and maintenance suggestions in the text. American cavers will likely never see a cagoule or pontonniere (specialist garments similar to a rain jacket and waders, respectively)but it is nice to know such evolved gear exists. Remote generator carbide lamps are thoroughly covered; I gleaned several interesting suggestions from this chapter that made my Petzl Ariane run more smoothly. Some interesting concepts are presented, such as the use of a foot ascender (best exemplified by the Petzl Pantin)to better enable a “vertical orientation” of the body while climbing. The insistence on using 8mm self-drive bolts as the primary anchors for vertical rigging will no doubt be controversial. These anchors are less likely to meet universal acceptance in the United States, where stainless steel studs and hammer drills are gaining in use. Several methods for doing a pickoff are presented but not the Sawatsky technique favored by many of my caving colleagues from Canada and Montana. Some cavers will disagree with the authors’ views–that’s fine. Marbach and Tourte are outlining the concepts widely used in Europe, especially as taught at the EFS (French Speleology School). 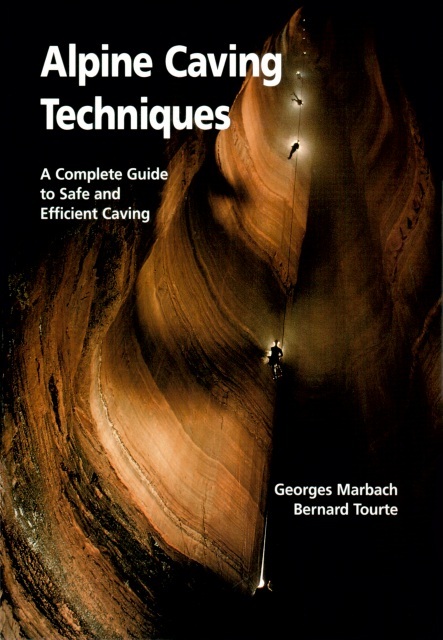 Marbach himself sums it up beautifully: “This edition is of course only a snapshot of French techniques for exploring vertical caves in the year 2000.” It is up to the individual reader to decide what he finds useful and chooses to add to his personal arsenal of caving tricks. Some of the information is merely interesting. I found the book so mesmerizing that I finished it in a single long night of reading. The next day I made several minor changes to my own Frog rig, ordered a second copy of Alpine Caving Techniques (to loan to friends) and cleaned my Ariane acetylene generator. If you are interested in a single source textbook on European caving technique, buy this one. You will not be disappointed.